Interested in seeing our commercial cold press juicer and bottle filler in action? Come into our professional showroom for a full demonstration and training session in how to use our market-leading FP100 Juicer and LF500 Bottle Filler. Our staff can walk you through just how quick and easy the FP100 is to use. Ideal for fruit and vegetable juices, along with cold pressing nut-based milks, you’ll be amazed once you taste the fresh, nutrient-rich drinks it can create. At our showroom we can demonstrate how to set up these machines for optimal use, along with tips on how to clean them and juicing in a commercial market. 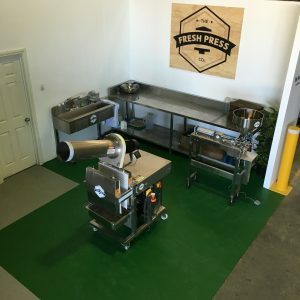 Just give The Fresh Press Co. team a call today at +613 9314 2511 to arrange your showroom appointment – and see the market’s best cold press juice machines for yourself! © 2016 The Fresh Press Co. All Rights Reserved.